I turn to Notepad++ for all my text editing needs. It is free, open source and extensible with functions. Like Firefox, it is the swiss-army knife of code editors. You can get any feature on it with the right plugins. However, it lacks sorely in visual interface and it looks so drab and it can get really bulky if you get too plugin-happy. 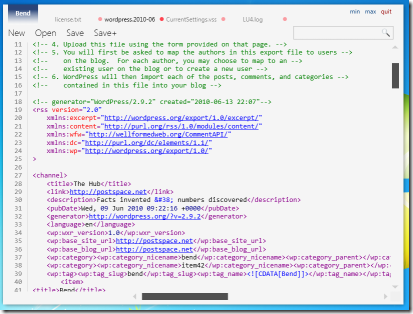 Bend Editor for Windows is a new free, fast and elegant text editor. Bend stands out with its simplicity and attention to letting you focus on the task at hand without distractions. Bend is a modern text editor. Bend takes off after the Zune client, but doesn’t constrain itself to it.Find on page borrows from Apple Safari. Tabs are Google Chrome inspired. 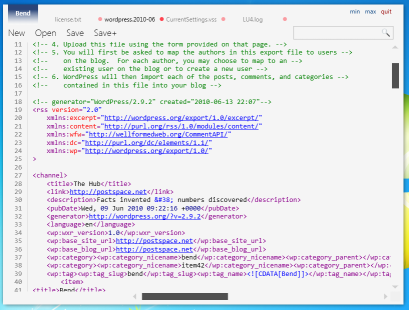 This text editor aims to be elegant, clean and a pleasure to work in. It exploits XAML / WPF to render beautiful hardware accelerated text, each feature is carefully selected to balance performance and style. Bend is built on the .NET 4.0 platform and says Windows 7 is a prerequisite. But, I was able to run it fine on Windows XP with .NET framework 4.0 installed. Bend is in beta and is available as a free download. I am not replacing Notepad++ for all my coding needs yet but Bend provides a nice refreshing change if I wanted to shift gears during the day.